We kicked off the show with the victorious team from The Scramble: Edd Stone, Tim Westybrook, Cameron Vessey and Christian Price... joined by the man who turned on his team, Cameron's Uncle Bryan Vessey... The group crowed about how intelligent they were... that they outsmarted Ricky Dale Johnson and Aaron Andrews, and now the commentator known as 'RDJ' is no more... They also said that Sam Keith would never compete this side of the border again... and tonight... 'The Enforcer' Tim Westybrook would be taking on... and taking OUT, the so-called 'Ace' Aaron Andrews... Edd and co. left the ring full of smiles... But their smiles turned to anger as they were interrupted by the music of Trent Shaffer!! Conspicuous by their absence was Ernest Youngman's group 'The Shooters'. He was going it alone tonight against the returning Trent Shaffer, and he struggled without his confidants to ask for advice, and to assist him physically. Shaffer was fired up, after losing in his big return match at The Scramble, and it was probably the worst time to face the man known as 'Cut Throat'. Shaffer didn't wait when he got an opportunity to put Youngman away. He grabbed both of his opponent's arms, and stomped on his chest to score the win with his 'Heart Burn'. After Trent Shaffer's big victory, we took a commercial break... 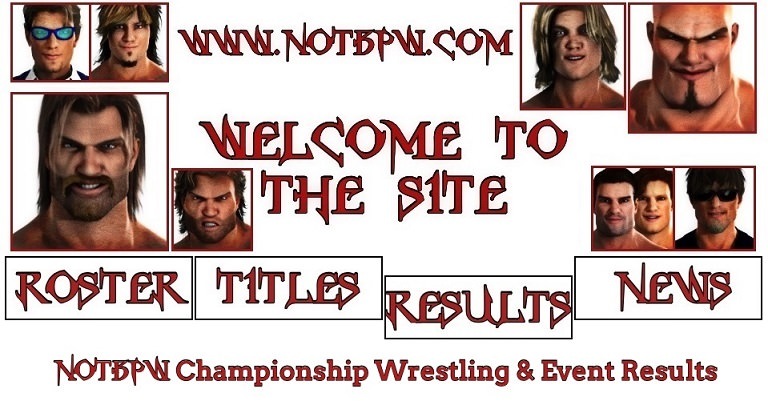 When we came back, the NEW NOTBPW Television Champion: Sonny Wildside headed to the ring to celebrate his huge victory from The Scramble, where he bested a man who has had an incredible 2017 to that point: James Hernandez... Wildside claimed to be the 'better man' in the 'Scramble Match', in which the last man to score a fall would walk out victorious... Wildside made three falls, and Hernandez amazingly made zero!! Wildside didn't mind talking about how badly he thought Hernandez did... Which brought the former Champion to the ring!! Two tag teams looking to build their way up the roster somewhat here, and two teams that really needed a win. John Maverick and Julian Watson seem to click more than Donte Dunn and Erik Strong, despite both teams having six months experience under their belts. For the finish, Dunn thought Watson was legal, and hit his 'Sunny Daze' spinning back fist finisher! But, Maverick was the legal man, and he locked Dunn in the 'Deadly Silence' Sleeper Hold, and Dunn passed out! Thrill Seeker and Akima Brave are experienced competitors, and so it was no surprise to see them put on the joint best match of the night here. Akima Brave dominated much of the battle, using his strength advantage to keep Seeker down and in trouble. As soon as the high flyer earned some space, he exploded into life with some flying kicks and a brilliant standing shooting star press. Akima Brave fought back, and delivered some forearm smashes to Seeker's face. But spinning back kick to Brave late on knocked him down to one knee. He followed it up with a running shining wizard, and then ascended the top rope. He flipped over and hit the 'Daredevil Drop' Moonsault, picking up a big win over 'The Man Beast'. Backstage, 'Awesome' Wade Orson was shown, still feeling the effects of his gruelling war with his rival POISON, which ended in a victory for the young Brit... However, after the match, POISON delivered a 'green mist' spray from his mouth and it blinded Orson, and his eyes still looked extremely sore... The announce team commented that he'd better get his mind focused away from his hatred for POISON, because after his impressive showings in recent months, he'll be competing in tonight's Main Event... against 'Wild Man' Jack DeColt... It's out of the frying pan, and into the fire, for Orson!! Los Monteros laying down a huge challenge for October Obliteration... But will Steve and Ricky DeColt accept it...?! We're going to see Los Monteros in action next week too, as they take on Lord James King and Hugh Ancrie in tag team action... But speaking of families, still to come tonight, Dan DaLay's sister Romy DaLay will be here LIVE... and she might lift the lid on Alex DeColt's big secret... Could what she says shake the very landscape of NOTBPW...?! Will Alex's job be on the line...?! Nobody has a clue as to what the secret is... But we could find out TONIGHT!! Robin DaLay and Logan are still learning their trade at the moment, but even though they are of a similar age, Aldous Blackfriar and Mutant outshone their opponents here. 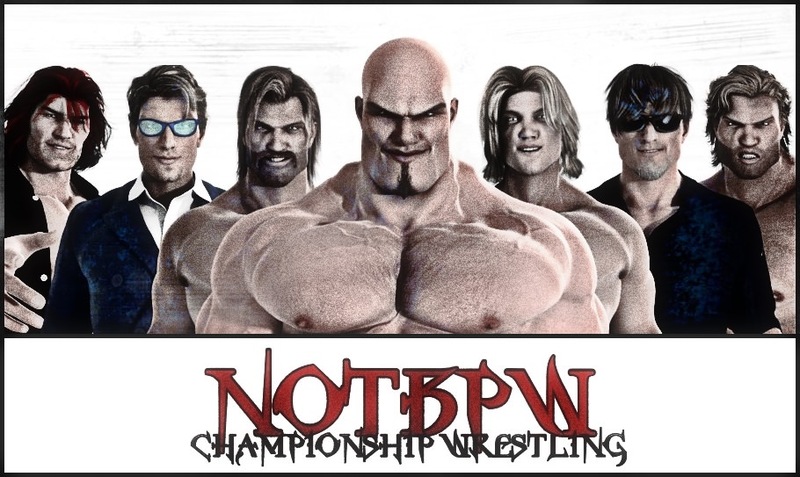 It helps that Mutant is 360lbs and a pure freak in and out of the ring of course, and Aldous relies on his 'muscle' to help him get ahead in NOTBPW. Tonight, Mutant flattened both Robin DaLay and Logan in the corner, before tagging Aldous back in to lock Robin in his 'Batwing' submission hold. Another excellent match here, and a longer one than Aaron Andrews would have wanted after a difficult night at The Scramble. 'The Ace' feels partly responsible for Ricky Dale Johnson losing his job in the four on four elimination match versus Edd Stone's team, which included Andrews' opponent tonight: Tim Westybrook. Westybrook is big, strong, and almost impossible to manoeuvre around the ring. But Andrews only needed a small opening. He was able to hit multiple cross-body blocks, and staggered Westybrook, before finally knocking him over after chop-blocking his knee! It wasn't long before Andrews finally hit his 'Hot Shot' (Spanish Fly), a move the announce team weren't sure he could hit on the big 'Enforcer'!! Wade Orson is riding a wave of momentum right now, but he came up against a vicious competitor in 'Wild Man' Jack DeColt. The young Brit found some success early on, using his quickness to stay out of Jack's grasp. He also outweighs Jack DeColt, but that didn't seem to bother the big Canadian, as once he got his hands on Orson, it was all downhill for 'Mr. Awesome'. Jack scratched at Orson's upper body, and used the ropes to his advantage to focus his attack on Orson's left arm. But late on, Orson managed a brilliant comeback. He rallied well, and used his good arm to deliver a collection of clotheslines and back elbows! In the end though, as he was closing in on victory, his rival POISON appeared at ringside, and delivered 'Green Mist' to Orson's face behind the referee's back!! Orson was blinded, and Jack DeColt was able to hit 'End Of Days' to score the win! The break in the anarchy in the ring didn't last long, as Dan DaLay ran over to Jack DeColt and punched him in the face for his attack on Robin DaLay... The melee began again, but Alex DeColt dragged Jack out of the ring, and the two of them stood huddled by the announce desk... Romy DaLay once again saw the opportunity to speak to Alex... and in front of the world, she shouted that he owes her a LOT of money... She's raised Logan all by herself, and Alex hasn't paid her a penny to help... He's a famous star on Television, and it's time for him to pay his way... Alex demanded that the show go off the air, and it did... More on this developing story next week! !